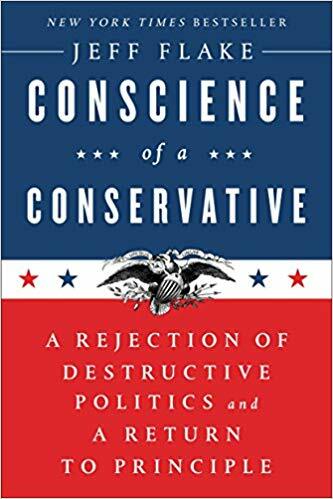 This book provides the rationale for Jeff Flake running for President in the Republican primary, opposing Republican President Trump. Flake retired from the U.S. Senate in January 2019, and shortly thereafter announced he would NOT run for president, and instead signed on as a political commentator for CBS News. I read this book because Flake's actions in the autumn of 2018 led me to believe that he WOULD challenge Trump for the Republican nomination � and this book seemed to confirm that � so I'll describe those events, which made Flake into a hero to a large group of voters (including me). First, a little about the book. The title echoes Barry Goldwater's book Conscience of a Conservative; Goldwater was the 1964 Republican nominee for president against Lyndon Johnson. Goldwater lost, but sparked a conservative movement that Flake still admires (and cites in the book). Flake says on the book cover, "Today, the American conservative movement has lost its way." That's a criticism of Trump -- Flake details HOW Trump's conservative movement has lost its way: "Conservatism has become compromised by other powerful forces � nationalism, populism, xenophobia, extreme partisanship, even celebrity" (p. xi). Flake goes on to criticize Trump in great detail throughout the book. But that's not what made Flake a hero. In September 2018, when Brett Kavanaugh was nominated for the Supreme Court, Flake was a Senator on the Judiciary Committee, which holds nomination hearings. Kavanaugh was criticized for sexually assaulting women while in college, and many protestors from the #MeToo movement attended the confirmation hearings. Flake, after confronting several protestors in a viral video, forced the vote on Kavanaugh to be postponed by one week so the FBI could investigate the sexual assault allegations. What made Flake a hero is that he actually listened to a group of protestors, heard what they had to say, and acted on it, knowing that President Trump would heavily criticize him for it. After the week-long FBI investigation, Kavanaugh was confirmed. And then Flake retired from the Senate, as he had always planned to do (which made standing up to Trump much easier, of course). And his new-found fans expected him to announce for President. But he didn't � saying "I do hope that there is a Republican who challenges the president in the primary. I still hope that somebody does, but that somebody won't be me" (Jan. 29, 2019). If Flake had run against Trump, my plan was to vote for him in the Massachusetts Republican primary. I'm a registered Democrat, so I would have had to switch my voter registration to do so � but I've done that before (for Ron Paul in 2012). I don't particularly like Flake, and I disagree with most of his issue stances, but I disagree with Trump even more, and I think a Republican primary challenger is very important for democracy. I planned to work to persuade other registered Democrats to do the same � noting that whoever won the Republican primary, we could still vote for the Democrat in the general election. Alas, Flake withdrew. And the only candidate to challenge Trump in the Republican primary so far is Bill Weld, whom I have voted for in the past, but who does not seem like a serious challenger for president. Perhaps John Kasich will announce a primary challenge -- and perhaps some Democrats will re-register to vote for him in the primary -- but Flake generated a real excitement to do so. Jeff Flake: Big-spending GOP gave away limited government mantle. Jeff Flake: Wrote Conscience of a Conservative because GOP lost its way. Jeff Flake: We get nothing done because of lack of political civility.